[davidgower] Both wickets today have been gentle lobs back to the bowler and this time it’s an easy catch for Malinga! New batsman Root is off-the-mark first ball with a drive down the ground for a single. Cook pulls a bouncer off his eyebrows for a single to end Malinga's over and keep the strike. Skipper Mathews decides the time is right to bring himself on. He's the seventh Sri Lankan to turn his arm over today so far. “@Colly622 : Proud that @joeroot05 has taken over my ODI number 5 shirt. Crackin lad, crackin player and a safe pair of hands.” Cheers lad! 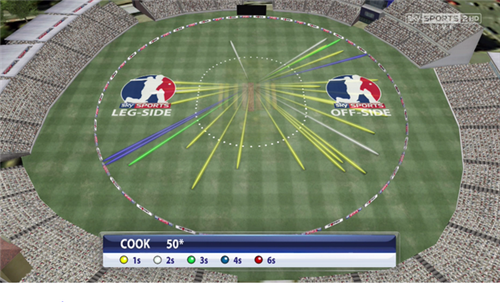 Cook completes his 19th ODI half-century (69b, 3x4) with a couple of singles during medium pacer Mathews' first over. That's the first time he's passed 50 in the format for almost a year. [nickknight] A ‘hard-working 50’ I think you’d call it. Lots of ones and just a handful of boundaries (three). Does it ever not rain at edgbastone when @SkyCricket are there??? Anderson takes the first over and his opening delivery is driven for a single into the off-side by Dilshan. 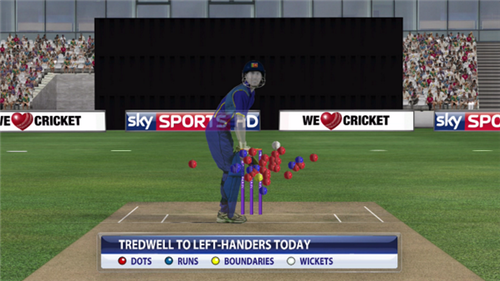 The left-handed Perera is happy to leave alone outside his off-stump where possible for the remainder of the over. Sri Lanka need 219 off 294 balls. Perera collects Sri Lanka's first boundary with a fine leg-glance after Anderson strays onto leg-stump and also gets two with a punch-drive into the covers. The left-hander ends the over by drilling a drive along the ground straight to the man in the covers. Sri Lanka need 207 off 282 balls. The umpires are happy to stay out for the moment. Anderson back on. 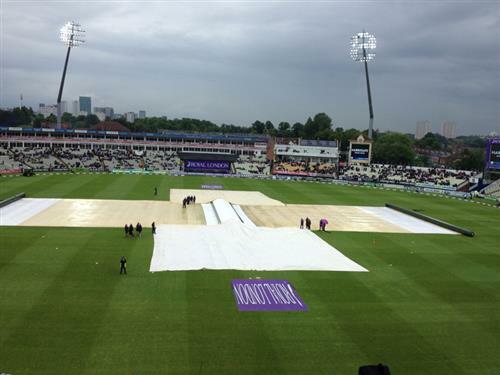 [mikeatherton] England need a couple of wickets in this over because the rain is falling heavily and if Sri Lanka are five down then Duckworth-Lewis has the winning score at 147. [power-play]Sri Lanka are taking the batting power play, mainly because they have to. The fielding restrictions are back in place for overs 36-40. Jayawardene is complaining to the umpires that his gloves are getting wet and he can't grip the bat properly but he's told to get on with it. Gurney back into the attack. Three runs from the over, would have been more but Bopara pulled off a sliding stop from the final delivery to save a couple of runs. Sri Lanka need 73 off 84 balls. That's why you need @MahelaJay in the team .... Well done Macho!!! Take em home.. C'mon !!! Jayawardene pushes a single off Gurney into the off-side to complete his 72nd ODI half-century from 417 (!) matches (87b, 4x4). Only one blemish when he edged between Buttler and Jordan at slip. Sri Lanka need 64 off 72 balls. [mikeatherton] Sri Lanka needed him today and he's responded. He's been in lovely silky touch after a quiet series. 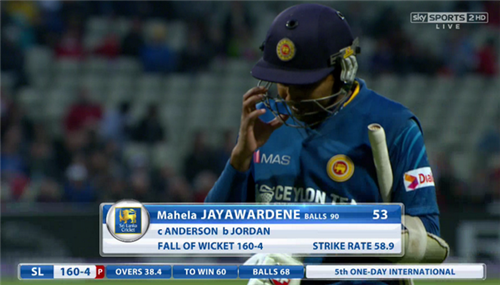 Jayawardene drives too early and hits it high in the air, Anderson taking the catch at mid-off. That shot came out of nowhere. 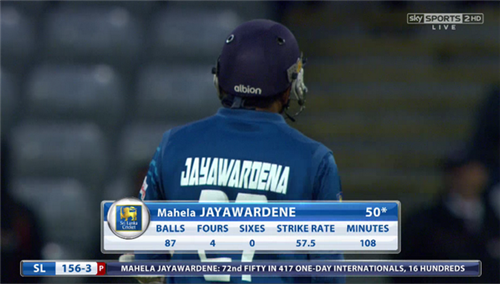 That was a total misjudgment of length from Jayawardene, it was much too short for the shot attempted. Sri Lanka skipper Mathews is greeted with another round of boos from the crowd... Sri Lanka need 58 off 66 balls. Tredwell is back on and he's got two overs left. Plenty of chat from England's fielders for Mathews, including Buttler having his say. Two singles from the over, both driven down the ground. Sri Lanka need 56 off 60 balls. Jordan is back on, Anderson's still got one over left to use at some point. Cook saving it for now. Good running allows Mathews to turn one into two and Jordan is then called wide for a too-short bouncer. 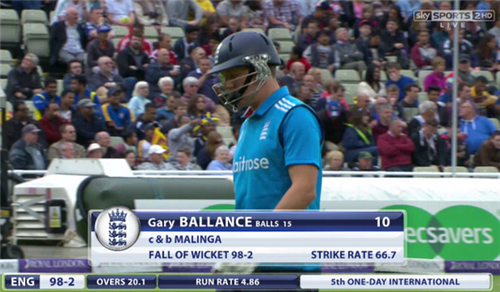 There are three other singles, including one steered off Mathews' outside edge to third-man, in an over costing six. Sri Lanka need 50 off 54 balls. Four from the over as Tredwell completes figures of 2-30 from his allocation. Excellent effort from the Kent spinner. Sri Lanka need 46 off 48 balls. 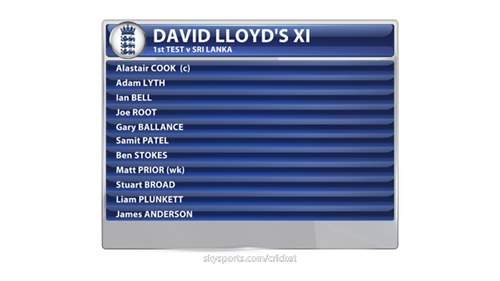 [davidlloyd] It’s a doddle for Sri Lanka now. Star the car. That’s a point, where is my car? Thirimanne continues to accumulate against Jordan, including a well-placed two behind square on the off-side. The required-rate is now up to a run-a-ball. Sri Lanka need 42 off 42 balls.